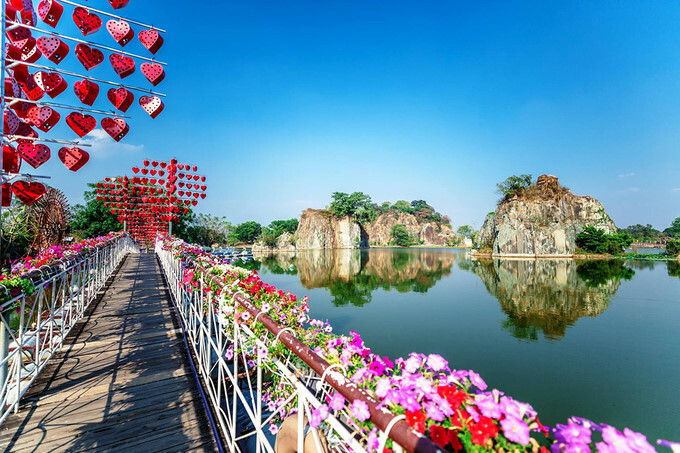 Tre Viet, Buu Long and Thuy Chau eco-tourism sites across Binh Duong and Dong Nai provinces are among some of the top destinations near tor HCM City that are perfect for a visit over the New Year period. Located about 20 km away from HCM City, the Tre Viet tourism site in Nhon Trach district, Dong Nai province attracts tourists with its peaceful natural scenery and wide-open spaces. This is an ideal place for team building and other outdoor activities. Visitors can experience a range of exciting activities such as kayaking, rowing, and cycling. The entrance fee is VND50,000 per person, and visitors are able to buy a combo including a ticket, the use of the swimming pool use and access to the buffet at a price of VND330,000. Roughly 6km away from Bien Hoa city in Dong Nai province, Buu Long tourism site is considered a ‘mini Ha Long Bay’. Covering on an area of 84 hectares, the site attracts visitors who come to visit the tranquil green islands and splendid mangrove forests. The highlight of the site is the magnificent Long An lake that is surrounded by rocks, architecture works and clean air. Visitors to the area can take a walk, camp, throw a BBQ party and get involved in kayaking or fishing. The entrance fee is VND70,000 for people over the height of 1.3 metres. 20km away from the centre of HCM City, Thuy Chau tourism site has plenty of green space, delicious food and a diversified range of services. This is the best place for visitors to enjoy a weekend getaway. Visitors with small children can relax beside the swimming pool and immerse themselves within the cool water of the stream inside the site. Ticket prices for adults is VND80,000 and VND40,000 for children who are between the height of 1.2 metresand1.4 metres. Tu Phuong That Dao eco-tourism site can be found 8km away from the centre of Ba Ria city in Phuoc Huu hamlet, Long Phuoc commune. It has received visitors since 2016 and has impressed many tourists with the site of a picturesque village inan area that covers more than 20,000 square metres. Visitors can enjoy activities such as rowing, fishing and visiting the orchards as well as experiencing local delicacies. Bang Lang Tim tourism site is 60 km away from HCM City and located in Nhon Trach district. The landscape is similar to that found in the west. It attracts visitors who come to enjoy the green trees and cool space. Visitors can go fishing, row a boat, and swim. The entrance fee is VND40,000 per person.